Yeasty off flavors can appear bready, yeasty, doughy, or be the flavor of a Vegemite sandwich. Most brewers are familiar with this “green beer” flavor having tasted their beer when it is still young. Those who have sampled Hefeweizen which is served with the yeast also have some idea of the flavor of yeasty beer. Not surprisingly the main cause of yeasty beer is simply that the beer is too young. Beer goes through changes as it matures including the mopping up of off flavors like diacetyl and also a critical process called flocculation where the yeast slowly falls out of the beer. Flocculation occurs at different rates depending on the beer and also the yeast strain used. You can, in fact, look up the flocculation rate for the yeast strain you are using by referring to the yeast data sheet. 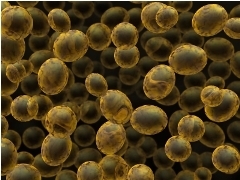 Yeast strains with high flocculation rates will usually clear much more quickly than those with slow rates. Some strains also produce more yeasty character than others. The main mitigation for yeasty beer is simply time. Certain yeast strains as well as lagers take additional time to flocculate and clear, so you need to account for the extra time needed before bottling or kegging your beer. A simple way to do this is to sample the beer periodically until the young “yeasty” flavor fades before packaging it. A second source of yeast in naturally bottled beer as well is kegs is the sediment at the bottom of the keg or bottle. When pouring from a bottle, avoid disturbing or pouring out the sediment. For kegs you may need to discard a few pints until the sediment is pushed out. Those are some tips on reducing yeasty off flavors in your beer. Thanks for joining me on the BeerSmith Home Brewing Blog. Be sure to sign up for my newsletter or my podcast (also on itunes…and youtube…and streaming radio station) for more great tips on homebrewing. I never think beer changes changes after time like wine or whiskey. In this case, prices also increase insanely?